No matter how old or young you may be, there aren’t many things in the world that can be as rewarding as traveling. Regardless of whether you’re taking a day trip to a nearby town or village, or taking a full-fledged vacation to a far off destination after weeks and months of planning, traveling does not only allow you to experience different cultures and traditions first-hand, but also broadens your horizons and makes you more accepting of people who don’t quite follow the same customs as yourself. And if you’re like most people, you probably want your children to experience the joys of traveling with you as well! After all, traveling will teach your children so much more than they’ll ever be able to learn in school. Much like yourself, your children will also get the chance to interact with people from all over the world, learning how to show love to humanity regardless of their background and ethnicity—something that all humans should be taught at a young age. Convinced? We’re sure you are. But you probably haven’t considered the fact that traveling involves a lot of walking and commuting through uneven terrains which young children might not be able to do by themselves. If your child is tired of all of the walking and moving around, they might not be able to make the most of the experience and end up losing out on the fun that you hoped they would have. Besides, if your child is tired or exhausted in a new place, you might not be able to enjoy your own vacation because your mind will be too preoccupied with the health of the apple of your eyes. Durability: Weighing 13 lbs. and made of aluminum, the durable Stroller has an open design and can be used to hold children up to 50 lbs. comfortably. Safety: With a 5 point safety harness and two-hand recline options, you can be certain that your child will always be safe in this convenience stroller. Storage: This Stroller does not only come complete with a hook and loop closure pocket, but also has a large storage basket included that is easily accessible, making it the best travel stroller that you could get your hands on. Cup holders are also included in the Stroller for your child to enjoy their favorite beverages and remain hydrated on the go. Canopy: Being a dedicated travel stroller, the Sumer Infant 3Dlite Convenience Stroller has a large canopy with a pop up sun visor that can help protect your child when you’re traveling to hot beaches or other areas with warm climates in the long summer days. Wheels: To ensure that your travels are as convenient as possible, the Summer Infant 2Dlite Convenience Stroller comes with 6 inch anti-shock front wheels with a swivel lock so that you can transport your children around without any problems. Grip: The handles of the Stroller are foamed so that you don’t face any discomfort or inconvenience when you’re on vacation or moving about with your children. Why Choose the Summer Infant 3Dlite Convenience Stroller? The Stroller is the best travel stroller available in the market for quite a few reasons. In addition to shock-proof wheels and a large canopy to protect your child from sunlight and harsh weather conditions, the Stroller is also safe and secure with its 5 point safety harness. But that’s not all. 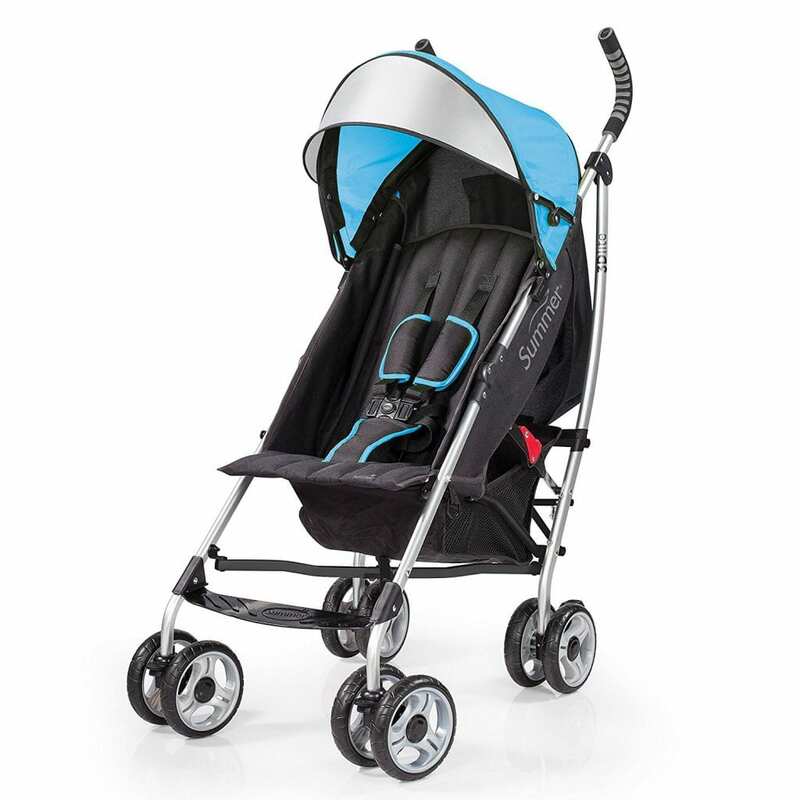 Your convenience has also been taken into account for the design of the Stroller with its lightweight and easy grip. Even though most people loved the Stroller, it didn’t quite cut it for others. Most people were not too happy about the fact that the sun visor had to be removed before the stroller could be folded, which proved to be a slight inconvenience and took up a bit of time that these people could spend taking in the sights and sounds of the destination that they were visiting. Certain people also disliked the sun visor of the Stroller because they were unable to keep an eye on their child while walking with the sun visor in place. The wheels, too, were a problem for some people who said that they experienced a problem or two with the lock lever and found the back wheel suspension a bit too rigid, ultimately compromising maneuverability every once in a while. Despite the few problems that the Summer Infant 3Dlite Convenience Stroller has much like any other product under the sun, the majority of the people who used it found it to be the best travel stroller. Security and convenience are some of the major factors that people take into consideration when they are looking for a stroller, and the Summer Infant 3Dlite Convenience Stroller offers just that. Additionally, the Summer Infant 3Dlite Convenience Stroller also comes in a number of different colors from Caribbean Blue to Hibiscus Pink which means that you can buy the world’s favorite travel stroller in your favorite color.